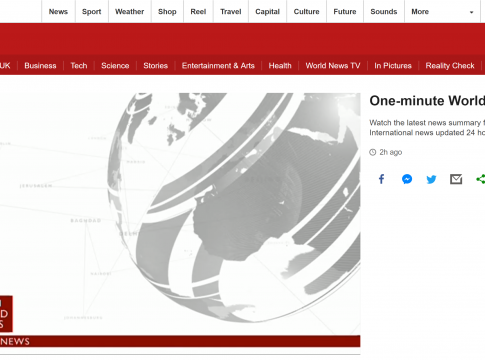 You can watch BBC World News live without cable with one of the following four options: Philo, fuboTV, Playstation Vue, Sling TV, and DirecTV Now. In this article, we’ll help you decide which streaming option is best for you. Let’s get started! Keep reading to get the details about watching BBC World News live, or click the banner below to use our Cord-Cutter Express tool. Just answer a few quick questions and we'll match you to the perfect streaming service, taking into account all of your watching preferences. Philo is one of the cheapest streaming services for cord-cutters on the market. Let’s take a closer look. The least expensive Philo subscription plan only costs $16/month and it comes with 44 channels. For four dollars more per month, you can upgrade to 58 channels. Philo’s base plan includes not only BBC World News, but also BBC America. It has a strong lineup of “edu-tainment” channels as well. Philo’s device support is good, but for some reason you can’t watch Philo on the Philo app for Android. However, you can watch Philo on an Android mobile device through the mobile version of Google Chrome. TV streaming media players: Apple TV (4th gen and up), Amazon Fire TV (all models), Chromecast and Roku (all current models). Smart TVs: Android TV (5.0 and up). Mobile devices and tablets: Android (7.0 and up, Chrome browser), iOS (10.3 and up). Desktop browsers: Most Mac and PC browsers. All Philo subscribers can share their account and stream to up to three different screens at the same time. Here’s a feature you might not expect from $16/month TV streaming service: an unlimited cloud DVR. In other words, you can record as much TV as you want with Philo’s DVR. fuboTV is all about sports and live 4K streams. Half the channels that you get with this streaming service are sports channels and no other streaming service supports 4K. fuboTV’s basic plan costs $55 and comes with 85+ channels. Learn more about fuboTV’s subscription plans here. As mentioned above, fuboTV markets specifically to sports fans– in particular, fans of sports that most traditional cable companies don’t carry like soccer and college basketball. The main downside: there are no ESPN channels. BBC World News and several other news channels are part of the lineup, though. You can see a full channel list here. Aside from the lack of support for game consoles, fuboTV has good app coverage. You can access your fuboTV account on Amazon Fire TV, Chromecast, iOS/Android and just about every other type of TV device. You can learn more about fuboTV’s supported devices here. fuboTV’s default simultaneous stream limit is two devices. However, there’s an add-on available that will give you three simultaneous streams. You can learn more about fuboTV simultaneous streams here. fuboTV’s basic cloud DVR has a 30-hour limit, but a paid upgrade gives you 500 hours. You can learn more about the fuboTV DVR here. Even though fuboTV is primarily a live TV service, there are some movies in its on-demand library. You can also catch recently aired TV episodes with fuboTV’s 72-hour rewind feature. Don’t assume that PlayStation Vue is about video games just because of the name. Truth be told, PlayStation Vue is one of the best cable replacement services for cord-cuttters on the market. The minimum amount you’ll pay for PlayStation Vue is $45/month– that’s the price of its cheapest subscription plan. You’ll have to upgrade to the $60 Elite plan to get BBC World News. However, the $80 Ultra subscription is a better deal because it has premium channels like HBO and Showtime. For more information about PlayStation Vue’s plans, click here. Access- the cheapest PlayStation Vue plan– comes with around 50 channels. Core comes with about 70 channels. Elite– the next step up– has 100 channels. Ultra is the most expensive plan and it has all the channels that Elite has, plus premium channels. Click here to see the full list of PlayStation Vue channels. TV streaming media players: Apple TV (4th gen and up), Android TV (all gens), Amazon Fire TV and Fire TV Stick (all gens), Chromecast (1st gen and up) and Roku (firmware 8.0 and up). Smart TVs: Amazon Fire TV (all gens), Android TV (all gens) and Roku (firmware 8.0 and up). Mobile devices and tablets: Android OS 5.0 and up, iOS 9 and up, and Amazon Fire HD6 tablets and up. Desktop browsers: Chrome, Firefox, Safari and Microsoft Edge are recommended (most recent versions will work). Click here to learn more about devices that work with PlayStation Vue. PlayStation Vue is one of the only streaming services that lets you stream to five screens at the same time. Click here to learn more about PlayStation Vue’s account sharing features. PlayStation Vue’s unlimited cloud DVR is like icing on the cake. You can record as much TV as your heart desires with it. Click here to learn more about how PlayStation Vue’s DVR works. Most of the on-demand content you’ll find on PlayStation Vue is of the “Catch Up” variety. In other words, many of the titles are TV episodes that have recently aired. Sling TV is a streaming service from the Dish Network, the satellite TV provider. As one of the very first cable alternatives, it helped popularize cord-cutting and bring it into the mainstream. With customizable plans and low prices, Sling TV is still very competitive. When you sign up for Sling TV you have to choose at least one base package. There are two base packages available: Sling Orange and Sling Blue. They both cost $25/month and come with around 30 channels. If you get both base plans, you’ll get a $10 discount on your monthly fees. Sling Orange and Sling Blue both come with AMC. The main difference between the two base plans boils down to Disney. ESPN and several other channels that are a part of what you get when you buy Sling Orange are owned by Disney. The channels in the Sling Blue package are owned by other companies. Sling TV has apps for nearly every TV device except PlayStation game consoles. That’s understandable though, since PlayStation has its own streaming service: PlayStation Vue. TV streaming media players: Apple TV (4th gen and up), Amazon Fire TV (all versions), Chromecast, Roku (LT and up), AirTV. Smart TVs: LG TV (Web OS 3.0, 3.5, and 4.0, as well as select 2016-2018 models), Samsung TV (2016 through 2018 models), Android TV (4.4 and up), Roku TV, Mi TV. Mobile devices and tablets: Android (4.4 and up), iOS (11 and up), Amazon Fire (tablets). Desktop browsers: Chrome on Mac and Windows recommended. Sling TV’s account sharing policy is restrictive compared to what other streaming services offer. Sling Orange channels can only be streamed to one device at a time. Up to three devices can stream Sling Blue channels simultaneously. Like many streaming services, Sling TV has a cloud DVR that lets you record TV content when you’re not around to watch it. You have to pay $5/month to unlock it, though. The capacity of the DVR maxes out at 50 hours. Though Sling TV’s specialty is live TV, it does have a growing library of on-demand content as well. Another bonus: you can use your Sling TV credentials to unlock a wide array of different TV Everywhere-compatible TV apps. Many of these apps have additional on-demand content that you can enjoy on a variety of TV devices. DirecTV Now had a bit of a buggy start when it first debuted and it didn’t have many features, which might be why AT&T decided to offer lots of price discounts and deals. A recent upgrade fixed most of DirecTV Now’s issues– but it also came with a price hike for subscribers that AT&T added a few months later. Even though the price of DirecTV Now’s cheapest plans is now $50, it’s actually not a bad deal because you get HBO with it. HBO costs $15 if you get it through the stand-alone service HBO Now. Plus: 40+ channels / $50 per month. Includes HBO. Max: 50+ channels / $70 per month. Includes HBO, Cinemax. For more information about DirecTV Now plans, click here. DirecTV Now’s impressive channel menu has allowed it to stay competitive with the other streaming services. However, you’ll have to get one of the pricier plans if you want BBC World News. Only Xtra ($124/month) and Ultimate ($135/month) come with BBC World News. Click here to see the full list of DirecTV Now channels. Click here to learn more about devices that work with DirecTV Now. Initially, you could only watch TV through two devices at the same time with DirecTV Now. A recent upgrade added support for a third simultaneous stream, but you have to pay extra to get it. DirecTV Now does have a cloud DVR now, but it’s nothing to get too excited about. Unlocking the cloud DVR will set you back $5 extra each month. You can only save 20 hours of TV to the DVR and there’s no way to get more storage. Click here to learn more about how DirecTV Now’s DVR works. You can watch BBC World News on Amazon Fire TV with one of these streaming services: Philo, fuboTV, Playstation Vue, Sling TV, and DirecTV Now. Installing any of these apps is as simple as picking the one you want from Amazon Fire TV’s app store. You can watch BBC World News on Roku with one of these streaming services: Philo, fuboTV, Playstation Vue, Sling TV, and DirecTV Now. Just go to Roku’s app store and download the icon that matches the streaming service you want to get. You can watch BBC World News on Apple TV with one of these streaming services: Philo, fuboTV, Playstation Vue, Sling TV, and DirecTV Now. Getting started with all these streaming services is a walk in the park, because they are all available in Apple’s app store. Google, PlayStation and AT&T are just some of the brands that have debuted over-the-top streaming services over the recent years. The growing competition is great for cord-cutters because it means you have more options than ever before. If you’re a fan of BBC World News, you now have several different ways to tune in without a cable subscription. PlayStation Vue has excellent account sharing features and excellent DVR support. No other streaming service lets you stream from five different TV devices at the same time.